Do you say kaizen event, kaizen activity, kaizen blitz, or cheese blintz? No matter what you call it, kaizen events are focused, quick and often dirty. But are they effective? 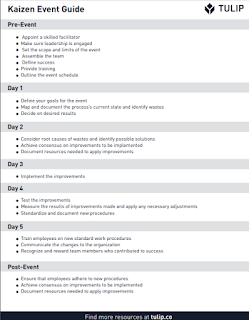 Tulip.co has come up with a practical guide to kaizen events, to help you get the most of your focused activities. Some people advocate weeks of pre-planning for your one week burst, and this may be required in some cases with complicated processes. Usually, it's best to not overthink the process and just get going. Going hard and figuring it out as you go often works just as effectively. Don't get me wrong, you still need a little something to keep the team on track during your multi-day event. Here's where tulip.co's downloadable guide comes in handy. It's a simple one-pager to outline what you should be doing during each day. It's a good tool to ensure you're not missing anything and help sustain the gains! So, do your research. Gather your team. Collect some data. 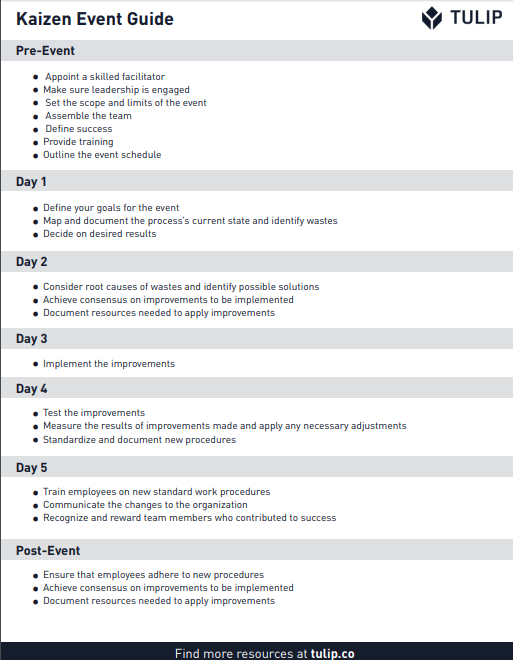 And grab this handy kaizen event guide to get you started. 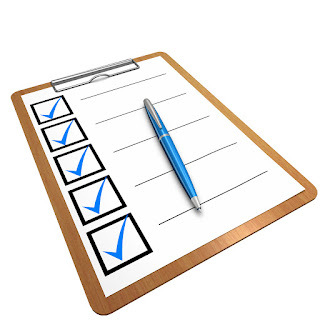 I've added this post to my list of Lean Tools and Resources! I do receive a few pennies from Amazon for each purchase made through that link, so if you do buy, I greatly appreciate it. Today we welcome a guest post from Varun Datta about agile transformations. Read more about him in his bio below the post. The primary motive behind the adoption of agile strategy is to achieve a faster outcome. Companies are migrating towards the acquisition of agile approach for better and lean performance. But some organisations are facing trouble even after the implementation of the agile methodology. There can be different hurdle which was not carefully examined before execution. There are various sources available over world wide web offering Agile and Scrum training for your company to let your team understand the sensitive areas of work for lean enactment. Division of departments according to work schedule. If you have not conducted any audit before starting your agile transformation voyage, then it will be challenging to evaluate any resources. You will also forfeit the primary building block of your organisation culture for agile because it is the primary ingredient for adapting successful agile transformation strategy. The agile methodology follows the concept of iteration and regular inspection. Implementation of new strategic approach with innovative methods in agile framework drives you closer towards success. You can define your approach by combining and matching methods from various agile frameworks depending upon your need. 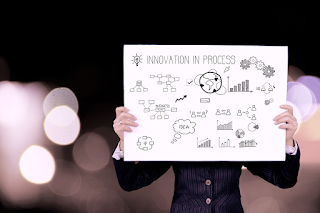 Attending methods or process those are incompatible or unsupportive to your requirement needs, objective or any other constraint can decrease your organisation performance efficiency and creates hurdle in adopting agile transformation. Always remember that multiple departments are assigned to work on separated environment and points towards various demands. So forcing them in the single agile framework can decrease their highest level of productivity. Whenever necessary, don't hesitate in introducing a different approach in your agile methodology allowing teams to follow agile steps and deliver their best outcome. This is how you can verify that the agile is successfully inserted into your company culture. Input and support of every individual in the company are very compulsory for adapting a victorious agile approach. If your company has not designed and developed any effectual training plan to indoctrinate your team with required knowledge and flair, then it may be difficult for you to attain the fruitful result. The main motive behind this training is to make them adopt your guided approach to practice. Your designed training plan must include every echelon of your organisation from management to a single team member. When it comes to lean training, you need to assess the activity of every individual. The team should be engaged in dealing with practical problems of the real world. This way they can devise for facing upcoming challenges encountered in the real world to deliver best of them. Some organisations consist of large teams with remote members in it. Agile methodology believes in the contribution of each team member for accomplishing a successful project. If remote workers are not regularly connecting with other team members, then it will be complicated for them to mark their 100% contribution to the project. Broken communication between team members can raise complexity in their mutual understanding. So it is the prioritised task to provide a clear picture of the whole project and maintain the record of progressive information clearly to share it with the team. In some organisations implementation of agile methodology fails because they don't have any prior experience with integration of the process phases. To overcome this problem scenario, companies can create a proper plan for implementation and teach it to every member including managers to decide their role in the respected process. The role of a tester changes with trends because it requires a new-fashioned mind to implement extraordinary features. Testing is performed regularly with the addition of new features in the project. So team for regression testing and quality assurance testing must be different to assure the effective work completion. Regression testing confirms that the product build in the past is working fine or not while QA team will suggest profound or significant changes in product quality. It is understandable that the size of the team should not be considered as more than seven members because it can cause misunderstanding results in ending up. The main problem appears when team members are partially assigned to a project as the devotion to work is not same. The dearth of trust among team members can result in making whole organisation toxic. Hence, following the right agile approach decides your overall efficiency. Commitment and trust relation between all team member transforms the whole working environment. Being transparent to reasonable deadlines and delivery can help you to walk a holistic path with agile towards a common goal. Varun Datta is a serial Entrepreneur and a vivid writer who loves to share what he has learnt in his Entrepreneurial Journey. 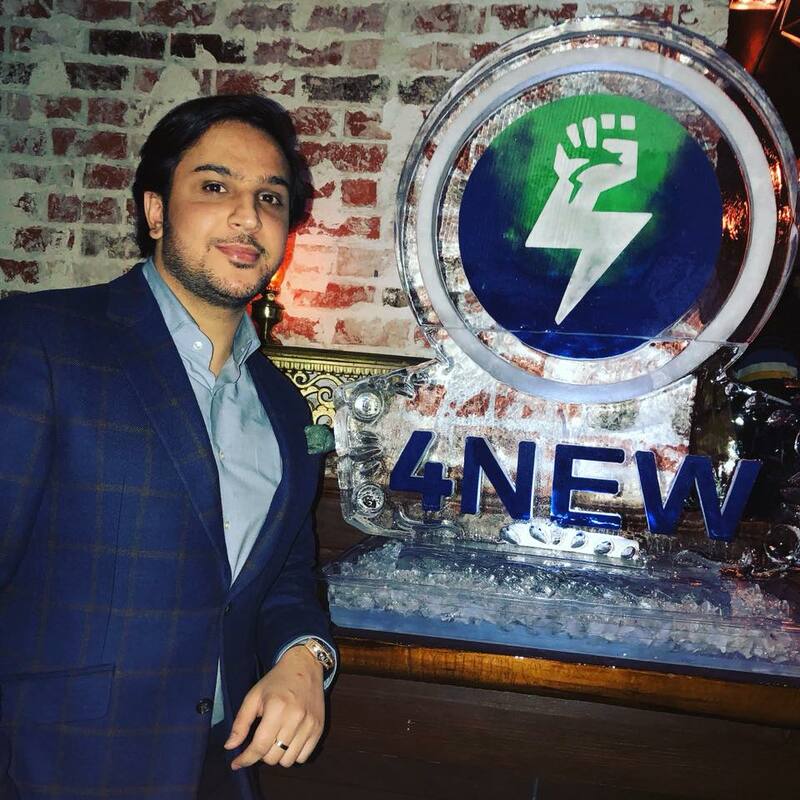 He has founded multiple companies, out of which 4New.io is the most innovative one. It is a waste to energy enterprise which is wholly focused on the production of electricity in order to power the mining of popular cryptocurrencies. In the west, service businesses dominate the corporate landscape. 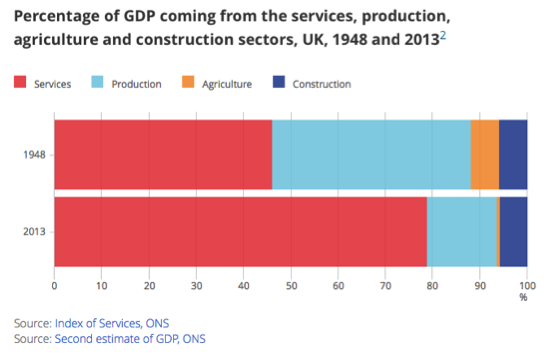 In the UK alone the service sector is almost 80% of GDP compared to 45% in 1948. For such a large sector, from an operational perspective the factors that affect customer choice are Customer Experience, Quality of Service and Speed. Operational excellence concepts were born in the Manufacturing industries. Lean is a well-known methodology for Operational Excellence, and it increasingly plays a large part in the service sector. For example, almost 65% of Finance sector organisations in the US1 are involved in Operational Excellence while in Europe 50% have or intend to have an initiative in Operational Excellence2. Lean also has a rich pedigree of simulations to enhance learning. These are played by groups or teams and the experience is an excellent way to learn about the 5 Lean principles, the definition of customer value and the 7 wastes. In my 19 years as a consultant, and having been involved in many lean simulations, it is very clear that people gain deep experiential knowledge, as well as better transfer retention of Lean principles, when they play such simulations. As Lean thinking has matured there has been a host of simulations in the market place, some which are basic (e.g. The 5S numbers game) to some which are a bit more complicated (e.g. The Plug Game). However Lean simulations for the service sector need to be fit for purpose. Many of the current simulations are manufacturing based and still used in service industries. Even the ones that claim to be “service” are based on more administrative/support activities rather than a full end-to-end customer process. These are processes such as opening a new bank account, insurance claims, buying an online product, health intervention etc. Customer experience is a core part of service delivery. Customer value exists in several dimensions (e.g. efficiency, quality and overall experience) and this is how customers judge the service process. In recent research the experience has often been the overriding feature even over functionality. A set Standard processes do not work in the service sector. 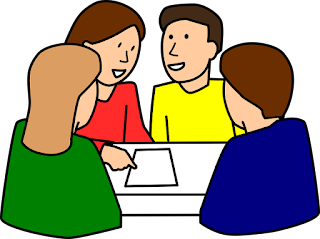 Lean games must recognise that a standard process cannot serve each customer individually, as there will be variations within the standard work such as sub process variations. There has to be a built-in measurement process that connects process measurements (i.e. cycle times, lead times, resources, quality outcomes, experience) to the bottom line (e.g. costs, revenue, reputation, asset utilisation). The game must allow the facilitator to improvise. More flexibility for the facilitator allows them to run the simulation so that the simulation will meet the learning needs of the organisation around Lean. Games must incorporate a strong element of fun while learning to keep people engaged. Laughter and humour combined with experience bring about eureka moments. This has led me to design a new Lean game around a fictitious Insurance company, InsureFlow that specialises in asset insurance and trades internationally. One of InsureFlow’s divisions provides tractor insurance. The goal is to deal quicker with claims, ensure a good service experience while improving productivity, reducing stress in the workforce, and achieving sustainable benefits to the bottom line. 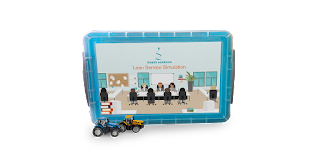 The simulation will let you understand the five principles of Lean, recognise the 7 wastes in the company, and grasp the relationship amongst customer value, demand, variation and their relationship to capacity and resources. The game comes in a well-presented box with clear instructions and a facilitator guide. Alternatively we can run the simulation for you at your premises. You can find more about the game at http://kinetik.uk.com/leansimulation/. “A new perspective on operational excellence”, Eurogroup Consulting. 2013. 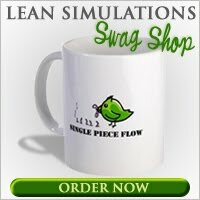 Jerry Levasseur at The Big Lean Simulation Library, LLC e-mailed me to let me know that they have released a free version of their Lean simulation library. It is released under a Creative Commons Attribution-NoDerivatives 4.0 International License, so you may use it for commercial use. See Jerry's website for more details. The downloadable simulation library can be found on the free download tab on the site.